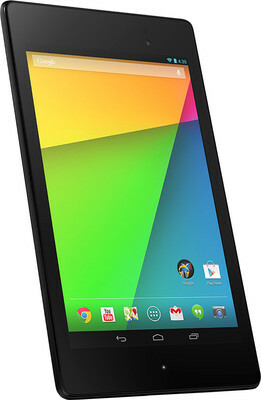 Google and Asus have done wonders by launching Nexus 7 (2013) which is the ultimate buy for anyone looking for sleekness,lightness and swiftness all at one place. An amazing upgrade from the original Nexus, the Nexus 7(2013) has a mature slab like look with a soft touch plastic back. The only physical buttons are the power button at the top and the volume rocker below it. Though it takes a little time getting acquainted to using it, it is at a favorable position for both left-handers and right-handers. It is light and almost pocket-able. The mere 8.65mm thickness and 290g weight makes it quite portable. The 9hrs battery life make it a good carry around. The panel is incredibly bright and is good for outdoor usability. The most striking feature is its display. The 7.02 inch 1920×1200 display has superb color accuracy . It provides full utility for every purpose from reading an eBook to viewing photos and movies. Text looks gorgeous at virtually any size. Photos and videos look vibrant without becoming over saturated. And the stereo speakers on the back of the tab too contribute to the experience. Placed on the far left and right ends of the tab ,they are loud enough to watch a movie without headsets in landscape mode. Playing games is engrossing too. Adreno graphics chip is well equipped for playing 3D games. With a RAM of 2 gb and 1.5GHz processor it can pretty much cope with everything. Navigation through the Android OS is smooth too. The 5mp rear camera includes auto-focus but doesn’t have a flash. The inclusion of the 1.2mp front camera is a definite thumbs up. Bluetooth 4.0,NFC, wireless display and dual-band 802.11 and Wi-Fi are all on board ,as is Qi wireless charging. The provision of Qi wireless charging at such low cost is highly commendable. Video Files MPEG4, H.263, H.264, 3GP, DivX, AVI..